Stories of cultural displacement feel worryingly relevant nowadays, and Lilac Yosiphon’s continent-spanning epic of identity is no different. 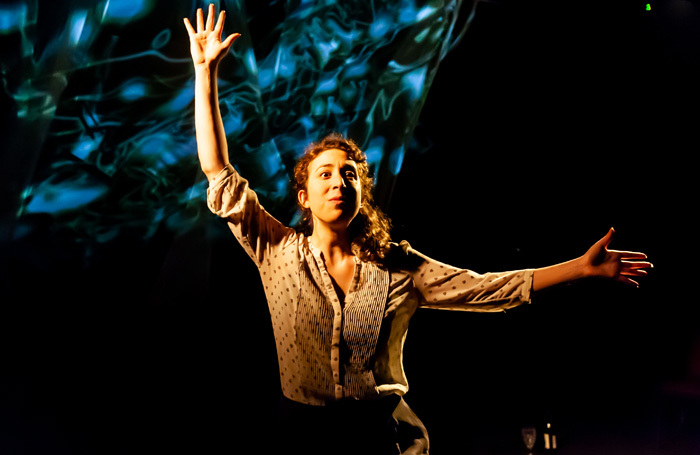 The story of Jasmine, a theatremaker whose UK visa is almost up, and her grandfather, who suffers from Alzheimer’s and lives in Tel Aviv, it is a piece of theatre which is infused with cultural anxiety. Using live guitar music and loop-pedalled sound, Yosiphon and her co-directors (Annie-Lunnette Deakin-Foster and Mike Cole) weave a claustrophobic atmosphere which deftly captures the looping mundanity and sadness of caring for a relative with Alzheimer’s. Alongside this narrative strand is Jasmine’s jolting, disordered journey through cities all over the world as she attempts to find some version of home. Yosiphon gives a winning performance, flitting from character to character with ease, and her writing has a winding, delicate beauty to it. It’s a shame, then, that she is obscured by Deakin-Foster’s cluttered, jarring movement direction which pushes both Yosiphon’s writing and performance into a more unsubtle and uninteresting place, as does Sam Elwin’s music, which signposts certain tonal shifts and emotions too overtly. Will Monks’ beautiful projection, however, goes some way to rectify this, with shifting lights projected onto the gauzy hangings at the back of the stage giving the audience a sense of unending flux. As much as Yosiphon’s twisting writing has its charms, Jericho’s Rose does run out of steam: the repetitions of certain phrases and images begins to exhaust and it begins to feel somewhat baggy. All in all though, it’s an admirable attempt at a simultaneously expansive and intimate epic.